I love the adventure of trying a new recipe. Not being sure how it will work out, whether everyone will like it and whether I’ll be happy with the final product… it’s a little bit of a thrill watching someone bite into your cupcake and seeing their face light up with delight! Of course, it’s a little nerve racking when you try something new. Sometimes the recipe isn’t perfect, the cupcake isn’t moist or the flavor is just not quite right. Regardless, I love the challenge and this cupcake was no exception. 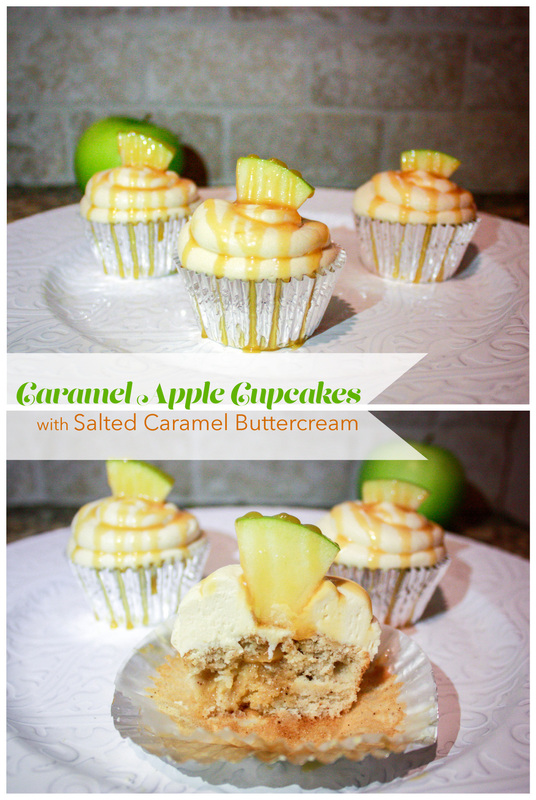 I was a little nervous chopping up apples into a cupcake, wondering if the texture would be odd, but they really do taste incredible! All this to say, I try to be adventurous with my recipes and I can promise everything you see on my blog will be tried and true (and absolutely delicious)! After trying this recipe, if you are as big of a fan of the Salted Caramel Buttercream as I am, check back soon for my absolute favorite Dark Chocolate Sea Salt Caramel Cupcake recipe… it is sooo amazingly good! !